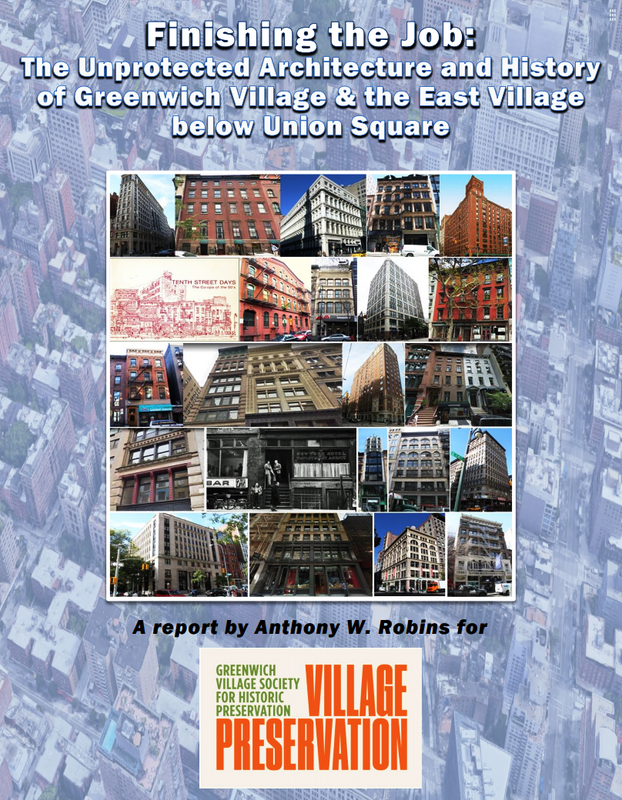 Village Preservation is proud to share our report “Finishing the Job: The Unprotected Architecture and History of Greenwich Village and the East Village below Union Square” by renowned architectural historian Anthony W. Robins, documenting and arguing for the preservation of this historic and endangered area – read it here. The report looks in vivid detail at the nearly two hundred historic buildings located in this area which played such an important role in New York’s development – from the center of the city's shopping and hotel district in the mid-19th century, to its role as the center of the art world in the years after World War II. Robins tells the story of the area’s development over nearly two centuries, and the rich architectural legacy that survives here, but which is increasingly threatened. Read the report here. Of course, this is more than an academic exercise. Nearly fifty years after the designation of the Greenwich Village Historic District, this area remains largely unprotected from demolitions, out-of-scale new construction, and insensitive alterations. The recent approval by the City Council of the Mayor’s Tech Hub upzoning on 14th Street, and the failure of City Councilmember Carlina Rivera to secure comprehensive protections for the affected neighborhood which she promised as a condition of her support, has only accelerated that danger. The City’s willingness thus far to only consider sevenof the nearly 200 historic buildings in the area for landmark designation leaves it vulnerable and woefully unprotected. 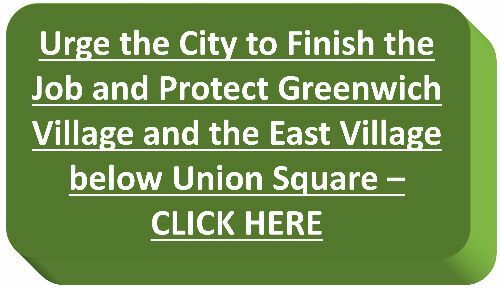 This report by a noted expert on New York City history, with decades of experience working on documenting and preserving our city’s landmarks, including with the New York City Landmarks Preservation Commission, provides us with another opportunity to push the Mayor and his Landmarks Preservation Commission to finally act to protect this area.